Labour leadership challenger Owen Smith accepted a £60,000 donation from an accountancy firm which has been accused of promoting tax avoidance on an “industrial scale”. Smith received the gift from City firm PriceWaterhouseCoopers in November 2011 while serving as a shadow Treasury minister. He said the benefit – in total worth £58,530 – was a “donation in kind” for “ad hoc advice” provided to Labour during the passage of the Finance (No. 4) Bill. Smith received this advice for a period of six months, until May 2012.Links between the Labour Party and PwC were particularly strong at the time, with shadow cabinet ministers during the last parliament including Ed Balls, Chuka Umunna and Rachel Reeves also accepting free advice worth hundreds of thousands of pounds from the company. However, some of their colleagues were always suspicious of the cosy relationship and last February Public Accounts Committee chairman and Labour MP Margaret Hodge declared this sort of help from PwC was “inappropriate”. Hodge’s committee also – produced a report – at that time which accused PwC of “the promotion of tax avoidance on an industrial scale”. Hodge wrote in February 2015 that evidence PwC had provided to her committee two years earlier – in January 2013 – was “misleading” – in particular its assertions that “we are not in the business of selling schemes” and “we do not mass-market tax products, we do not produce tax products, we do not promote tax products”. News that Smith was happy to accept such a significant gift from so controversial a source, albeit prior to publication of Hodge’s report, sits uncomfortably with his claims to be a socialist and promise to close the gap between the – “haves and have nots”. It also highlights a key difference between him and Labour leader Jeremy Corbyn. lthough Corbyn raised about £220,000 in cash and gifts during last summer’s Labour leadership contest, almost all of that cash came from trade unions. None of it was from big business. Smith has already come under fire for his previous job as an £80,000 a year lobbyist for pharmaceutical giant Pfizer, triggering a row with Corbyn’s allies who regard having held such a post as Blairite. Before working for Pfizer, Smith worked for BBC Wales. Unusually, he secured his full time job for the broadcaster at around the same time as his father took up a senior management post there. Smith Jnr’s CV states that he began working for the BBC in 1992 months after leaving the University of Sussex, but it is understood he did so on a freelance basis initially before becoming a fully fledged producer. He later worked for the BBC in London. His father, Prof David Smith, confirmed to Heat Street that he and his son were employed by BBC Wales simultaneously, with Smith Snr being appointed head of radio at BBC Wales in 1993. In 1994 Smith Snr became Head of Programmes at BBC Wales. Smith Snr told us: “I didn’t appoint Owen and I wasn’t Owen’s boss.” He also said that they didn’t work on any programmes together, ruling out any suggestion of nepotism. However, Owen Smith has been able to make some use of his BBC connections. In 2013 he was given two tickets worth £781 to watch Ireland play Wales at rugby. His benefactor? BBC Wales. A spokesman for Owen Smith said he would get a comment from the MP regarding the PwC donation and the specific circumstances of his BBC employment. He said it was important to note that Margaret Hodge’s PAC report was published more than two years after Smith’s receipt of advice from PwC had lapsed. Nick Smith is V-C of Progress. His wife Jenny Chapman MP is also a V-C of Progress. She appeared on George Galloway’s TalkRadio talk show as a surrogate for Owen Smith last friday and made a disgusting connection between Jeremy Corbyn, his supporters and the appalling death of Jo Cox MP by a man in her constituency! – this isn’t gone to trial yet so I can’t write any further on the subject other than is common knowledge. The distortions the media and anti-Corbyn MPs provides – often at the behest of affiliated business interests – means that popular conversation and perspective is at best skewed or fact is obscured completely, there must be a fight to directly disrupt and challenge this narrative with FACTS. Big-Pharma, Pfizer & Amgen, professional PR Lobbyist Owen “Man of the People” Smith is a figure firmly of the neoliberal establishment. My support goes to Jeremy Corbyn the last remaining hope to reclaim a party for it’s roots in SOCIALISM & the WORKING CLASSES. Yvette Cooper just made me LOL then have a coughing fit! She has no sense of IRONY or self-knowledge! Hehehehe… OMG… Irony overload from Mrs Ed Balls! Yvette, you are an Oxbridge educated career politician speaking on behalf of a cabal of other Oxbridge educated career politicians that form the bulk of the anti-Corbyn PLP plot. You stood as a “heavy weight” leadership candidate 10 months ago and got trounced by the membership! The Labour party was indeed formed to ensure that for every banker, aristocrat and boss sitting on the green benches, there would be a docker, a miner, factory worker and a steelworker sitting opposite. Since that time our economy has changed, but where are the MPs from the call centres, care homes and warehouses? Oh! They’ve been elbowed out by the likes YOU and your permanent political class. Big-Pharma Pfizer & Amgen professional PR Lobbyist Owen “Man of the People” Smith, the poor man’s Sgt Bilko, is a figure firmly of YOUR establishment. While most of the rest of Europe have experienced some wage growth since 2007, including crisis devastated economies like Spain (+2.8%) Ireland (+1.6%) and Italy (+0.9%), UK workers have seen a catastrophic decline in earning power only matched by workers in the economic catastrophe zone that is Greece (-10.4%). Ordinary British workers have seen the deliberate decimation of their wages since the Lib-Dems enabled the Tories back into power in 2010. Meanwhile the super wealthy minority have literally doubled their wealth since the economic crisis. Aside from overseeing the longest sustained decline in wages in economic history, a reduction in earning power only matched by the crisis stricken Greek economy, a huge upwards redistribution of wealth, and the slowest economic recovery on record, the Tories have also been savagely attacking working rights too. Just look at the furious way the French have reacted to attacks on their employment rights with continued riots (mostly unreported by UK MSM), and consider that they’ve enjoyed a 10% increase in their earning power since the pre-crisis period. In Britain we’ve had a 10.4% decrease in our earning power and most people have sat back compliantly as the Tories have repeatedly snatched our employment rights away. What will it take for the Sheeple of the UK to wake up from their torpor? The decline in UK real wages since the pre-crisis peak is the most severe in the OECD, equal only to Greece. Both countries saw declines of 10.4% per cent between 2007 Q4 and 2015Q4. 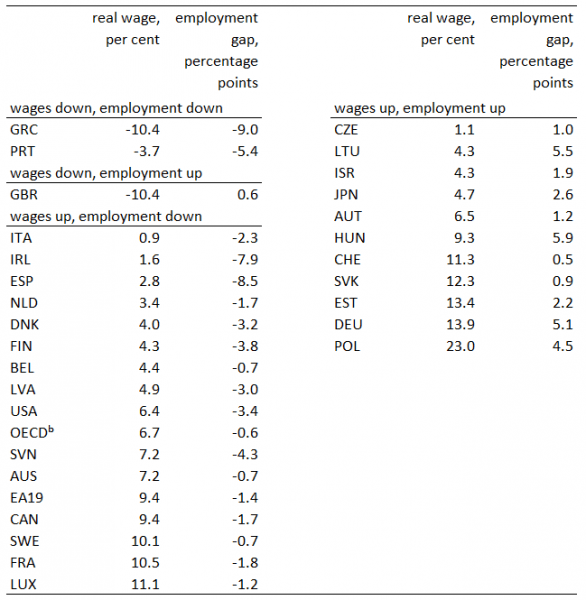 Apart from Portugal, all other OECD countries saw real wage increases, albeit mostly modest ones. These results are derived from figures in the 2016 edition of the OECD’s Employment Outlook (released a couple of weeks ago, but it has taken me some time to get hold of the figures – see endnote for details of calculation). Even though most countries have seen real wages rise, growth rates are generally disappointing – under normal condition you might expect around 2% a year, and so 16% over eight years. The government’s argument is that flexibility on wages has permitted the employment gains. Whatever your view of the theory, the data show this is not obviously the case. In spite of the largest falls in wages, the UK ranks sixteenth (of 42) in terms of job gains (though the employment chart includes some non-OECD countries that have performed well). Any flexibility in Greece was completely pointless. Moreover the countries with the highest gains in real wages were also among those with the highest employment gains. 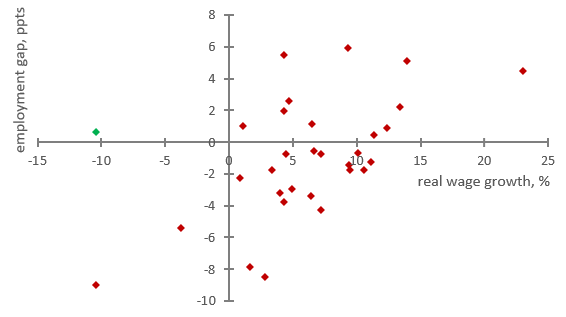 Plainly the relationship between wages and employment is not as straightforward as notions of flexibility might suggest. The following chart compares outcomes on employment with those on wages (the underlying data by country is in the annex). The UK is very much an outlier – the only country where a good jobs performance is associated with a bad (terrible) real wages performance. Thankfully the UK is not Greece or Portugal in the bottom left quadrant. Taking the low wage road may have helped to keep jobs afloat in the UK; in contrast, in the majority of countries (in this sample) the employment gap was still negative but wages rose (bottom right quadrant). It is possible to think that economies/policymakers face a choice between these two options. But this would be wrong – other countries have managed to have it both ways (top right quadrant). These are mainly central European countries: Austria, Czech Republic, Estonia, Germany, Hungary, Lithuania, Poland, Slovakia and Switzerland along with Japan and Israel. All these countries have benefited from strong aggregate demand in recent years, in particular through exports and/or government spending. Plainly this is not a decisive measure of performance, if such a thing exists. My sense is that outcomes in the post-crisis period should be assessed alongside a comparison of performance relative to the pre-crisis period (see for example my examination of the effect of spending cuts cross the OECD – here). On this basis of the countries above, those ‘A8’ countries (that joined the EU from 2004) may have performed strongly over the post-crisis period, but have seen a significant reduction since the pre-crisis days. Nonetheless the above results offer a valuable perspective on labour market outcomes overall. We knew already that the UK had endured the longest and steepest decline in real wages since at least 1830. We now know that this decline is matched by no other country apart from Greece. Gains in employment are not adequate compensation. Endnote: the total wage decline is derived from Figure 1.6, by compounding the separate growth rates for 07Q4-09Q1, 09Q1-12Q4 and 12Q4-15Q4. Note that the OECD derive real wages from national accounts information, dividing total wages by hours worked and putting into real terms with the household consumption deflator. These can differ from those based on average weekly earnings and CPI inflation that tend to be used in the UK. Geoff Tily joined the TUC as Senior Economist in August 2014. Revolution must not only “make the world philosophical,” but make the world artistic. It is a psychological law that the theoretical mind, once liberated in itself, turns into practical energy, and, leaving the shadowy empire of Amenthes as will, turns itself against the reality of the world existing without it. see also: http://genius.com/Robert-c-tucker-the-marx-engels-reader-chapter-13-to-make-the-world-philosophical-annotated a blog discussing Marx’s doctoral dissertation, “The Difference Between the Democritean and Epicurean Philosophies of Nature,” written between1839 and 1841. It is a psychological law that the theoretical mind, once liberated in itself, turns into practical energy, and, leaving the shadowy empire of Amenthes as will, turns itself against the reality of the world existing without it. (From a philosophical point of view, however, it is important to specify these aspects better, since from the specific manner of this turn we can reason back towards the immanent determination and the universal historic character of a philosophy. We see here, as it were, its curriculum vitae narrowed down to its subjective point.) But the practice of philosophy is itself theoretical. It’s the critique that measures the individual existence by the essence, the particular reality by the Idea. But this immediate realization of philosophy is in its deepest essence afflicted with con­tradictions, and this its essence takes form in the appearance and imprints its seal upon it. When philosophy turns itself as will against the world of appearance, then the system is lowered to an abstract totality, that is, it has become one aspect of the world which opposes another one. Its relationship to the world is that of reflection. Inspired by the urge to realize itself, it enters into tension against the other. The inner self-contentment and completeness has been broken. What was inner light has become consuming flame turning outwards. The result is that as the world becomes philosophical, philosophy also becomes worldly, that its realization is also its loss, that what it struggles against on the outside is its own inner deficiency, that in the very struggle it falls precisely into those defects which it fights as defects in the opposite camp, and that it can only overcome these defects by falling into them. That which opposes it and that which it fights is always the same as itself, only with factors inverted. [Work on the present study] began towards the end of the First World War and in its aftermath, at a time when the German proletarian revolution should have occurred and tragically failed. This period led me into personal contact with Ernst Bloch, Walter Benjamin, Max Horkheimer, Siegfried Kracauer, and Theodor W. Adorno, and the writings of Georg Lukács and Herbert Marcuse. Strange though it may sound I do not hesitate to say that the new development of Marxist thought which these people represent evolved as the theoretical and ideological superstructure of the revolution that never happened. In it re-echo the thunder of the gun battle for the Marstall in Berlin at Christmas 1918, and the shooting of the Spartacus rising in the following winter. Korsch’s insight into this theme from the early thought of Karl Marx, reaffirmed subsequently by Adorno and his best followers, can be extended to encompass art and religion as well. For Hegel, of course, art and religion each provided — in their own, particular way — privileged access to the Absolute. Art reigned supreme in the ancient world, while religion dominated medieval thought (with its “great chain of being”). By the time Hegel was writing, however, these modes of apprehending the Absolute had been surpassed by philosophy, which rationally comprehended the Absolute Idea in its spiritual movement. Intuition and belief had been supplanted by knowledge. Science, or Wissenschaft, had been achieved. Yet this achievement did not last long. After Hegel’s death, his successors — Left and Right, Young and Old — battled for possession of the master’s system. Only Marx succeeded in carrying it forward, precisely by realizing that philosophy itself must be overcome. The same may perhaps be said for those older forms of life which had the Absolute as their object, art and religion. Feuerbach’s religion of humanity, which read theology as secret anthropology, perhaps found its most revolutionary articulation in the writings of Bogdanov, Gorky, and Lunacharsky, who promoted a project of “God-building” [богостроиетльство]. Lenin rightly scolded them for their excessive, premature exuberance, but they were on the right track. Similarly, the avant-garde project of dissolving art into life, in hopes of bringing about the death of art, can be read as an effort to make the world artistic (“to make the world philosophical”). Or, better, to make the world a work of art. In the society of the future, in which we live with our hopes, and still more with a good many illusions that are not always the fruit of a well balanced imagination, there will grow out of all proportion, until they are legion, the number of men who will be able to discourse with that divine joy in research and that heroic courage of truth which we admire in a Plato, a Bruno, a Galilei. There may also multiply infinitely the individuals who, like Diderot, shall be able to write profound and beguiling things such as Jacques le Fataliste, which we now imagine to be unsurpassed. In the society of the future, in which leisure, rationally increased for all, shall give to all the requirements of liberty, the means of culture, and the right to be lazy, this lucky discovery of our Lafargue, there will be on every street corner some genius wasting his time, like old master Socrates, by working busily at some task not paid for in money. What follows, then, are a couple excerpts. First from Leon Trotsky’s Literature and Revolution (1924), and after from Henri Lefebvre’s lecture on “Nature and Nature Conquered” (1959). Both of these, I like to think, corroborate my above claims. Moreover, illustrations included from Vera Mukhina 1925 pamphlet Art into Life. Frankie Boyle has just won politics, you won’t read a better analysis of the current state of UK politics, and some of these metaphors are the funniest thing I’ve read in ages! “Theresa May claims to want compassionate Conservatism, and for the party to be greener. So fingers crossed her next ‘go home immigrants’ poster vans are all going to be hybrids. It’s great for girls to see a female leader, say people who live under the longest reigning female monarch and an equal pay structure worse than Namibia. May is currently meeting a few world leaders so that they can get to know the real woman behind their citizens’ cavity searches and illegal detentions. It does feel a bit awkward turning up in France right now wanting to talk about Brexit, like we’re a neighbour rocking up at a funeral asking if we can have our Tupperware back. Angela Merkel was quick to pay her respects. May is very popular in Germany where she’s a character from a childhood cautionary tale about not cutting your nails. Of course it’s lazy sexism to compare May to Merkel, Thatcher, or to any female leader. We should instead compare her to people with similar qualities, like Judge Dredd or a sort of crocodile man that once ate me in a nightmare. Any idea that she was going to show a gentler side in her new role disappeared when she stood up in Parliament, looking like she’s solely made from the bones they left out of Boris Johnson, and announced that she’s prepared to push the nuclear button with the suppressed grin of a serial killer on a conjugal visit. The Tories are currently brain-storming how to cherry pick the absolute worst parts of EU membership while jettisoning all that stuff about human rights and environmental standards. For the left-wing Brexit voter,this is going to be like sending your Christmas list up the chimney and finding the only wish you’re granted is the wheezing old stranger watching you sleep. And let’s pause for a moment to imagine how badly Johnson, Davis and Fox are going to play with Europe’s technocratic negotiators. Soon a UK citizen’s best chance of getting an EU passport will be showing Islamic State’s forgery department a full HGV license. I was sure we’d never need Trident to stop other states from attacking us. But then Boris was made Foreign Secretary and I thought, ‘could be time for a rethink’. One thing we can be sure of, his translator’s going to be getting a fair few smacks in the mouth. It’s easy to underestimate his achievements, without Boris I doubt there’d be that ‘do not consume while pregnant’ warning on bottles of Pimm’s. He’s undeniably a product of the public school system, the sort of kid whose parents’ evenings consisted of apologetic appearances by the butler. And it might be just as well: if he’d gone to a comprehensive he’d have been wedgied clean in two. Meanwhile, the Parliamentary Labour Party is trying to replace Jeremy Corbyn after ten months, showing all the patience of Prince waiting for his paracetamol to kick in. We’re told Corbyn is useless, then he manages to put together a more competent cabinet out of his billiards partner, an ex-girlfriend, mirrors, and some masking tape than May did with the entire back catalogue of fee-paying education’s finest. It’s weird to see the media cast him as a bully, and it might just be a simple case of projection. At the moment he’s re-enacting a Spanish bullfight. He’s a beige bull staggering around an allotment with a couple of dozen swords sticking out of him, heroically whispering, ‘Who wants a courgette, I’ve got a glut’. Corbyn hasn’t formed a strong opposition, say a parliamentary party who voted for renewing Trident, bombing Syria, and cutting benefits. Really what Labour MPs are selling is a sort of nihilism. They have grown up in a party where their core vote had no option but to vote for them, and where until recently members had little power. So they’re going to go into a leadership election asking their members to, essentially, abandon hope. The only time most Labour MP’s are going to try and inspire the working class these days is if they need a new kitchen fitted for a short-notice dinner party.You have to wonder how they’d fare under the same media scrutiny as Corbyn, particularly after a week where the Syrian bombing they voted to get involved in killed 85 civilians and one of the rebel groups it was supposed to support beheaded a child. In a way Labour are the only party reflecting the mood of the country, by loathing each other. Angela Eagle withdrew from the leadership race. There was nothing about her that suggested leadership – she looks like she’d shriek every time Putin entered a room and has the voice of a Collie locked in a hot car. Owen Smith was head of policy for Pfizer, but despite his best efforts there still aren’t enough drugs in the world to make his election seem like a good idea. Smith looks like his most radical policy will be not wearing a tie to the park. There are a lot of people in Britain who need radical ideas, because the status quo for them is simply not survivable. Even with the full weight of the media behind them, it’s going to be very difficult for Labour to persuade such people that things can go on as they are, that there’s a non-radical solution. The TORY impoverishment of Student Nurses. Yesterday was the last day of parliament in a week where the HoC voted with a clear majority to commit to £205BILLION in spending on a Trident weapons of mass annihilation nuclear weapons system, and the new PM used the day, like the coward she is, to announce that bursaries for the education of new student nurses will be cut from 2017. Meaning nurses will face £50,000+ debt for a degree qualification on top of which they already work a 35hr week on top to achieve. Money for Nuclear Bombs / Massive personal DEBT for student nurses! This was just one of many “bad news” stories hidden yesterday. This Theresa May government will get away with murder… just like the previous Tory administration did with IDS. This all happened under David Cameron’s watch. Jan, a lady of unknown age suffering from Fibromyalgia, driven to the point of mental and physical breakdown by this governments welfare reforms. Jan was found dead in her home after battling the DWP for ESA and DLA. Stephen Lynam, 53 suffered from anxiety, depression, high blood pressure, a heart condition and musculo-skeletal problems. Found ‘fit for work’ after a WCA. After 22 weeks his mandatory reconsideration was turned down. Facing eviction, not eating properly and getting even more depressed he died shortly after finding out he was allowed to appeal the departments decision. Malcolm Burge, 66, was left in despair after finding himself more than £800 in debt because of a cut in his housing benefit, drove himself to the Cheddar Gorge in Somerset where he took his own life by setting himself alight in his Skoda Octavia. Benjamin Del McDonald, 34 took his own life after his benefits were stopped and he was threatened with eviction from his home. Mark Harper has insisted the Government is right to ignore these achievements. David Cameron is “proud” of George Duncan Smith’s achievements! The European Human Rights Convention is suspended during the State of Emergency in Turkey after failed coup attempt, according to Turkish Deputy Prime Minister Numan Kurtulmus. Turkey will suspend the European Convention on Human Rights as the country enters into a 1.5-month state of emergency following an attempted government overthrow, Turkish Deputy Prime Minister Numan Kurtulmus said Thursday. “We want to end the state of emergency as soon as possible, within a maximum of 1.5 months. The European Human Rights Convention is suspended during the State of Emergency,” Kurtulmus told reporters in Ankara. The state of emergency entered into force Thursday after being announced by President Recep Tayyip Erdogan and published later in the official gazette.In the wake of the attempted coup, Turkish authorities have conducted an unprecedented crackdown on individuals believed to be involved, including governors, prosecutors, intelligence officers, judges, and military personnel. The EU foreign ministers urged Turkey on Monday to abide by the norms of the Convention, including the abolition of death penalty, when punishing participants of a coup attempt numbering in the thousands.